Collection of resources for selecting and using a hydrostatic liquid level sensor. Use this page to navigate between products used for measuring depth and level, application articles about liquid level measurement, questions answered on measuring hydrostatic pressure, technical jargon about hydrostatic level measurement and some useful technical reference documentation. Hydrostatic liquid level sensors are pressure sensors which are specifically configured to measure the vertical height of a given fluid above the installation point of the sensor. The measured hydrostatic pressure is directly proportional to liquid height and the conversion ratio is dependent on liquid density and local gravitational force. 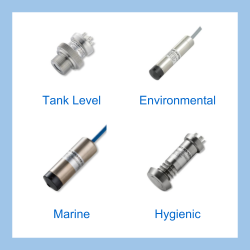 Choose a featured hydrostatic liquid level sensor from the list below to view product specification details and request a price quotation. Find product information for the type of hydrostatic liquid level sensor you are looking for. Liquid level sensors and probes for measuring and controlling hydrostatic fluid level in liquid storage tanks, boreholes, reservoirs, rivers, waterways, tidal water or sea water. Find liquid level instrumentation compatible with a range of media types such as water, saltwater, wastewater, diesel, petroleum, chemicals and caustics. If you would like us to select a hydrostatic liquid level sensor for you, then please use this form to specify your requirements. These sensors have been certified for use with intrinsically safe barriers in hazardous areas where there is a risk of explosion. Hazardous area external mount level sensor for use in zones where there is a high risk of explosive gases being present. This level sensor is screwed to the outside of a tank and has been examined and certified for use explosion risk areas such as petrochemical process plants, landfill sites and waste water treatment works. ATEX/IECEx intrinsically safe IP68 sensor for liquid level measurement in intrinsically safe installations on petrochemical, pharmaceutical, landfill and sewage treatment sites. This hydrostatic transmitter maybe used in zone classed hazardous areas where volatile gas and vapour is present. Brackish water depth and level sensor with housing material for use with tidal and coastal sea water. This sensor is suitable for sustained immersion in waters which contain a mixture of freshwater and seawater, such as coastal estuaries where rivers meet the sea. The housing of the sensor is made from marine bronze which is highly resistant to saltwater corrosion. Plastic based level sensors suitable for direct contact with corrosive liquid chemicals. Caustic chemicals are highly corrosive to metals and thin metal diaphragms can be quickly eroded ultimately causing mechanical failure. In these applications it is best to use hydrostatic level sensors with plastic housings and Ceramic diaphragms which are resistant to aggressive chemicals. Plastic liquid level sensors with a PVDF housing and Ceramic diaphragm for fitting to the outside of a chemical storage tank. 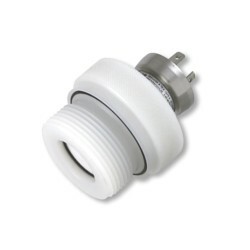 This sensor has a flush diaphragm for easy cleaning and a plastic threaded port to ensure no metal components vulnerable to corrosion are exposed to the chemical contents. Chemical resistant submersible level sensor with a PVC housing and ceramic diaphragm for measuring the hydrostatic level of harsh chemicals. This sensor has no exposed metal components which would otherwise corrode when exposed to corrosive chemicals. Different cable coatings and seal materials can be chosen to adapt compatibility with specific chemicals, concentration and temperature. Stainless steel 316L submersible level probe for measuring the level of freshwater in boreholes, reservoirs, rivers, canals, streams and wells. Freshwater is a relatively benign medium for measuring liquid level and most hydrostatic level sensors which are made from stainless steel will be compatible and have a long operating life. However even freshwater can be highly corrosive to some grades of stainless steel when certain minerals or ions are present due to the local geology. High sensitivity liquid level sensors for measuring shallow water depths. Low range level sensor with threaded port fitting for mounting to the outside of a small liquid storage tank. This sensor has a large diameter diaphragm and variable capacitance sensor technology which is ideal for measuring the very low pressures generated by small range liquid levels. Low range submersible level sensor for measuring very low liquid levels in shallow rivers, weirs, drains, sewers, streams and small tanks. This sensor has an open flush diaphragm so it can be lowered to almost touch the bottom to ensure the lowest liquid level is measured. An open diaphragm also prevents trapped air forming which may interfere with the accuracy at low levels of measurement. Marine approved hydrostatic liquid level sensor for use in marine environments. This sensor is designed to be lowered into a tank or mounted to the outside of the tank in a wet environment. The sensor is suitable for measuring the level of seawater ballast, diesel fuel, wastewater and liquid cargo tanks. Non-vented absolute range level sensor for measuring liquid level where it is not possible or practical to connect a vented gauge reference. This sensor has fixed pressure reference and level readings are not self-compensated for changes in barometric pressure. Fixed reference level sensors are typically used in underwater vessels where it is impractical to run a vent tube to the surface. It is necessary particular with low range depth measurement to also measure the barometric pressure separately to adjust the reading to the correct depth. Marine bronze submersible level sensor which is suitable for immersing in seawater for long periods to monitor depth and tidal changes. This sensor is constructed from materials that will withstand long term exposure to salt water in coastal and offshore installations. SDI-12 interface level sensor with a serial digital interface for measuring liquid depth and returning the reading to low powered telemetry instrumentation in remote locations. This sensor is intended for use with environmental monitoring instrumentation which utilises the SDI-12 software communications protocol. Miniature submersible level sensor for measuring ground water level in small diameter bore-holes. This sensor is typically used for geotechnical research applications where many small holes are drilled into the surface to test for natural or manmade effects on groundwater level. General purpose submersible hydrostatic liquid level sensor for lowering into a tank, bore hole, river or reservoir. This sensor is low cost and adaptable to many applications where a lower cost device is more important than measurement accuracy, and there are no constraints on the diameter of the sensor. Combined temperature & level sensor which provides a dual signal output for both temperature and hydrostatic pressure measurement from one device. This sensor will save on installation time & cost in applications where there is only space for lowering down one probe. Screw-in process connection hydrostatic liquid level sensor for mounting on the outside wall of a liquid storage tank to measure the head of fluid. Select sensor options compatible with your application such as a flush diaphragm for thicker liquids or a plastic process connector with a ceramic diaphragm for corrosive chemicals. Waste water such as sewage will block pressure ports in a similar way as viscous media and flush diaphragm hydrostatic level sensors are preferred to reduce the potential for clogging and make cleaning easier. Due to the presence and potential build up of flammable gases from sewage it is required in some countries to use intrinsically safe hydrostatic level sensors in waste water treatment works. IP68 wastewater level sensor for hanging inside a wastewater tank. This sensor uses a high performance ceramic diaphragm that can be easily cleaned and which is resistant to abrasion. For applications where there is a high level of methane present in the air, there is the option for an intrinsically safe version. Screw-in wastewater level sensor for attaching to the outside of an surface wastewater tank which provides an open flush diaphragm to discourage clogging of the diaphragm sensing area. This sensor has robust exposed diaphragm which can withstand high overload pressure surges and abrasion from solids. Find advice and guidance on specifications, applications and installation of hydrostatic liquid level sensors. Useful pages which you can refer to when specifying or using hydrostatic liquid level sensors. I am looking for a sensor to measure the change of level in a reactor which works at atmospheric pressure. The liquid in the reactor has a very basic pH (12-14), what type of level sensor could be used? Typically we would suggest pressure sensors with a plastic housing, FFKM seals, and a ceramic diaphragm for acid/alkaline applications. However each chemical has unique properties, which also vary with different concentrations and temperature, so we recommend users assess suitability by comparing each material used in the construction of the sensor to the chemical being measured. If you use a hydrostatic pressure sensor that is referenced to atmospheric pressure via a vent path behind the sensing diaphragm, then you do not need to compensate for atmospheric pressure in the reactor, since each will cancel the other out. Does a hydrostatic level sensor give the same output signal if the tank is at sea level or say on a mountain 2000 metres high, since the air pressure acting on the liquid surface is lower on top of the mountain? If the hydrostatic level sensor is vented to atmosphere on the reference side of the pressure sensing diaphragm, it will self compensate and be unaffected by changes in altitude. Measuring water level using a pressure sensor is mainly affected by changes in density and gravity. A 2000 metres change in height will change the pressure by about 0.3 mmH2O due to changes in gravity, so only a very small amount. Do you have a sensor that can measure a corrosive liquid with a reasonable accuracy in small tank application? The liquid that will be measured is a generated chlorine dioxide solution, so PVDF and Teflon are usually the contacted material of choice. I think PVC would also be acceptable. The tanks are typically 49″ tall. The sensor can be mounted on the bottom of the tank or on the side at the bottom. We would suggest either the LMK351 for screwing into the side of the tank at the bottom or the LMK809 for lowering to the bottom of the inside of the tank. Both sensors can have PVDF housings with a Ceramic diaphragm for chemical resistance, plus a choice of seal materials. I’m interested in your small diameter groundwater level transmitters, however I need something less than 12mm in diameter to fit inside a 5/8-inch ID tube. Do you have anything this small? We would suggest the MTM3000 which is a submersible miniature pressure transducer with a diameter of 10 mm. We have a requirement to measure 0-10 meter column of water. In the past we have used a transducer with a 1 bar range and a 4-20 mA output. The accuracy needed is around +/- 5cms. We do not understand the advantage and difference between vented and non vented transducer, can you guide with this and suggest a suitable type of transducer to measure the water level? 10 mH20 is approximately the same as 1 bar, see our meters of water column page for a more precise conversion. A 5cm accuracy is equivalent to a 0.5% full scale accuracy for a 10mH2O range instrument. Where possible you should always use a vented device, since it is a more accurate and a simpler method compared to using a non-vented pressure measurement device for measuring liquid level. The vast majority of installations use a vented pressure sensor to measure liquid level. We have a problem with the control of a borehole pump. The borehole pump is at the base of the well at around 250 feet deep. The level control system has been wiped out by lightning on more than one occasion. The electrical circuit is fitted with surge protection and lightning arresting components, so I was wondering if the submersible level probes might have something to do with the problem? If the screen wire which runs through the level probes signal cable is connected at the sensor end to a metal body and also connected to a grounding earth at the surface, this can increase the chance of damage from voltage surges induced by lightning strikes. If the screen is connected at both ends it is possible for an earth loop to be established. Since the level probe is submerged in water, an earth loop is created from the surface ground, down the length of the sensor cable, out through the sensor into the water, and eventually back to the surface ground. If the level control system is subjected to a voltage surge due to a lightning strike in the vicinity, some of the high voltage energy which is diverted to ground by the lightning arrestors will flow around the earth loop and take a longer amount of time to dissipate. This lingering voltage surge can cause interference and permanent damage to sensitive circuitry such as sensor components and micro-electronics. Since the purpose of the earthed screen wire is to protect the long signal cable (which effectively acts like an antenna picking up electromagnetic interference) from EMI, it only needs to be connected to an earthed ground at one end to provide protection from the normal levels of interference such as radio waves, electric motors and pumps. Check to see if the sensor screen is connected to ground at both ends, and if it is, try disconnecting it at the sensor end to see if that reduces the occurrence of failures due to lightning strikes. It is very difficult to eliminate damage caused by lightning entirely since the energy involved is so great, but an optimised installation can greatly reduce the likelihood of damage and lower the recurring cost of replacement instrumentation in a lightning prone location. I need to measure the level of liquid by using pressure transmitter fitted at the bottom of the tank. Please suggest the formula to use to calculate the range for pressure transmitter? dia of the tank is 2500 mm. If you use a submersible pressure sensor to measure the level of liquid in a square tank, will it give an accurate indication of the remaining volume, even if the tank is tipped up on one edge? Is the shape of the tank important, or do you only need to know the total volume and the height of the tank to get an accurate indication of remaining volume? A submersible pressure sensor will provide a signal that is linearly proportional to liquid height and is independent of length & width of the tank. If the sides of the tank are vertically uniform (horizontal cross sectional area does not change), the output signal will be linearly proportional to the volume left in the tank. However if the sides are not uniform vertically, as is the case in your example with a tilted square tank, the output will not be linearly proportional to the volume left in the tank. I am looking for a food grade pressure sensor to monitor wine tank levels. The tanks are either stainless steel or cement, and they range from 50.000 to 200.000 litres. Please advice if you have a suitable sensor with a 4-20mA output? We would suggest the DMP331P which is a hygienic level sensor suitable for use with food & drink, as long as the food grade oil filled diaphragm seal option is specified. The components that will be in contact with the wine are all stainless steel 316L. Send us your enquiry for Hydrostatic Liquid Level Sensors to get assistance with this product type.